Hardgrave unpacking the burlap pieces. 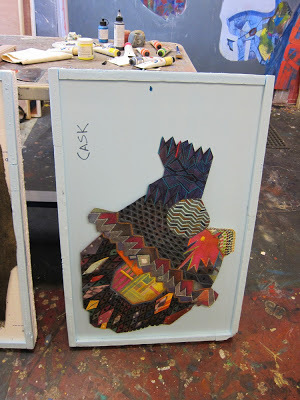 Because they’re in the Styrofoam crates, the pieces look framed, but actually he installed them on a wall clustered in groups, unframed. 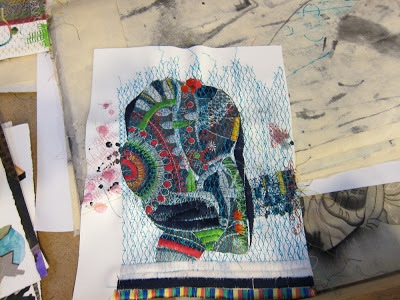 Click to see the intricate stitching. Sometimes Hardgrave covers entire sheets of paper with fancy stitches that look like delicate netting. 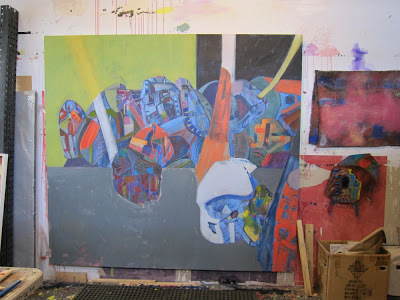 Here’s a big painting (6 x 7 feet or so) that he’s been working on for a while. Even when he paints, Hardgrave’s angled brushstrokes often mimic the look of stitching or woven fabric. 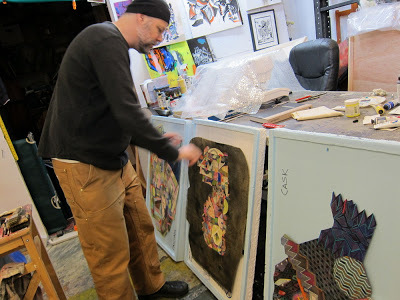 Self-taught except for a graphic design degree from a community college, Hardgrave has formidable drawing skills and his work recalls the brio of flamboyant street art, but he himself is a quiet, low-key character. I asked if he ever worked on street projects, but he just chuckled and said he preferred working alone, in the studio. 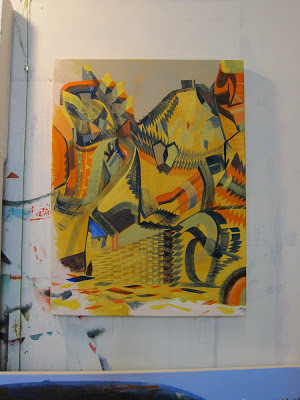 Hardgrave also took me to see work by some of his studio neighbors even though they weren’t around. 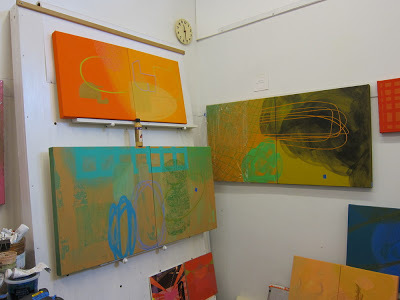 These vibrating, abstract paintings are by Gillian Theobald, whom I met later at our opening at SEASON. 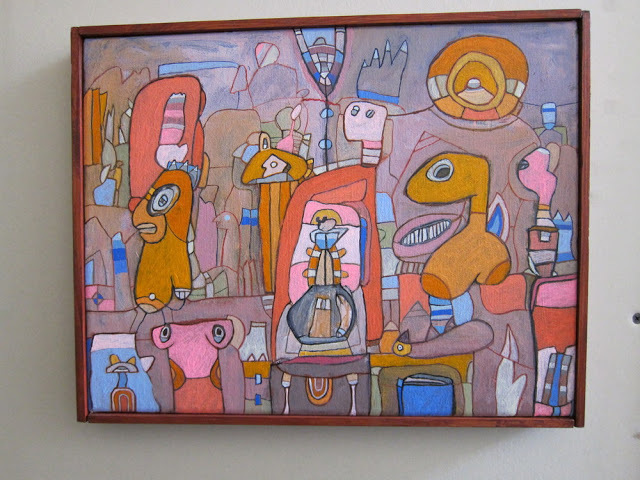 One of Danielson’s small paintings. A stack of big ones leaned against the wall out in the hallway. This quirky C. L. Utley was out in the hallway, too. 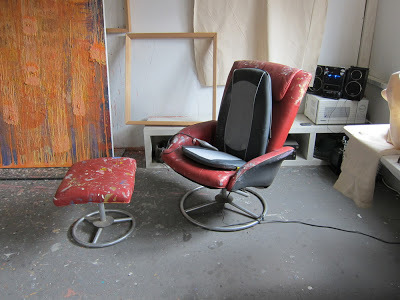 I want Andrée B. Carter‘s painting chair. 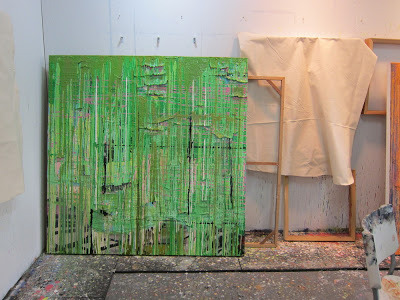 Her paintings, which are heading to Heriard-Cimino in New Orleans, are thickly layered with flaking fabric and paint. 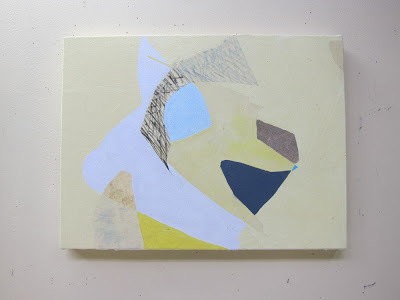 The canvas and stretcher on the right aren’t part of the piece, but they look good together, right? fantastic energy in that building, great people making great things! 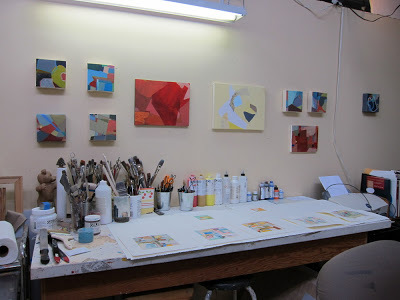 Love all of this work!! Thanks for posting. Looking forward to Andree's show(I live in New Orleans). I know her from way back!